When my son was two years old he was obsessed with stories. This went on for two more years. Every time we got into the car he would insist on having us tell a story. And it couldn't be just any story. He would lay out very specific parameters like, "Tell me a story about Superman and the Swamp Thing." This is harder than it sounds, especially when you're tired, which was most of the commute hours for me. For a while I tried to come up with good traditional swashbucklers for the kid, but after a while I started putting the heroes (or Transformers or whatever he asked for) into more mundane situations. Typically these stories existed for as long as it took to tell them and then they were forgotten. For some reason T liked this one and I think she asked me to write it down. So I typed it up when I got to work and sent it to her. I just came across it again and I thought I'd share it, if for no other reason than so that you can share in the absurdity of what my commute was like for two solid years. "Once upon a time Thor and Captain America went camping with the rest of the Avengers and some of their kids and friends. It was like, their annual company retreat. So one night they're sitting around singing campfire songs. And they sang Kumbaya, and Little Bunny Foo Foo, and they were deciding what to sing next when Thor suggested "If I had a Hammer." And everyone kind of groaned because Thor ALWAYS suggests "If I had a Hammer." And Thor was like, "What, I'm Thor, hammers are kind of my thing." So they went ahead and sang "If I Had a Hammer" which was fine except the beginning is kind of hard because Thor likes to hammer though the first verse. And Thor's a big strong guy and he hammers really hard and it scares the woodland creatures and drowns out the rest of the singers (which is a shame because the Scarlet Witch has a really beautiful singing voice). Then they got to the verse about "If I had a shield with a star on it, I'd deflect bullets in the morning, I'd throw it at bad guys in the evening, all over this land." 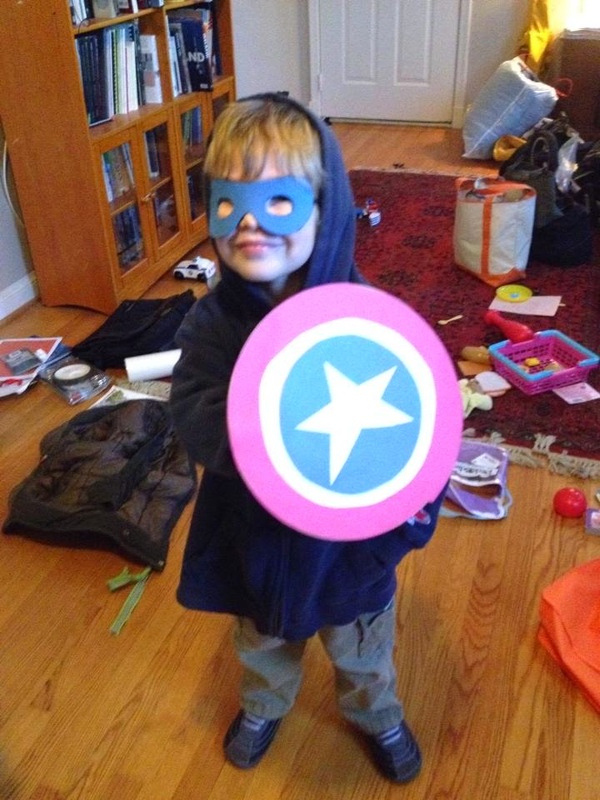 At which point Captain America lunched into a tangential solo of "This Land is Your Land" because he's Captain America, and he can't help it, he gets really excited about having a shield and being named after his favorite country. When the song was finished they asked if anyone had an idea for the next song and Thor suggested "John Henry was a Steel Driving Man." And the other Avengers were like, "Dude! That's another song about hammers!" And Thor was all, "What? I like hammers. They're kind of my thing." And everyone groaned again, but they went ahead and sang "John Henry was a Steel Driving Man" because they like Thor and it's a fine song, and even though it's the kind of thing you hate to love it's really become a tradition to sing a bunch of "hammer" songs on the company retreat.